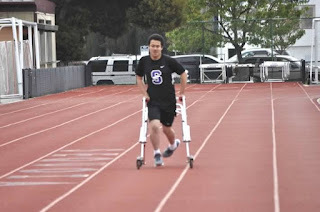 Today we chat with Sequoia HS junior runner, Stephen Langi (photos courtesy of Sequoia HS coach Andrew Hutchinson). His PRs for the 100 and 200 might not be impressive at first glance but there is much more to this athlete than times. 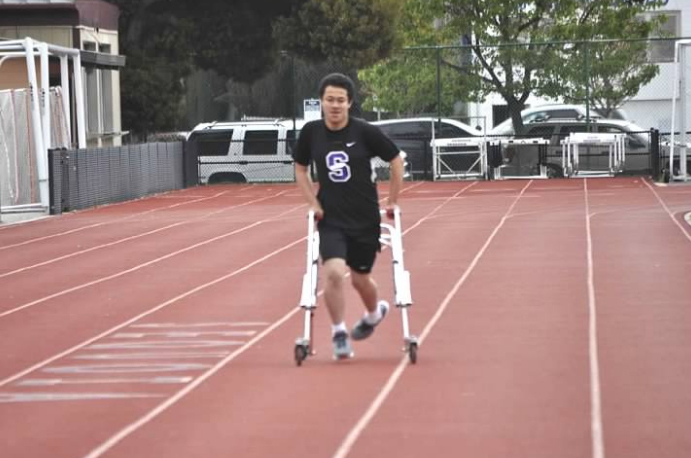 At the recently completed San Mateo HS Bearcats Invitational, Stephen competed in his specialties with a roaring, applauding crowd cheering him on during both races. I was fortunate to be in attendance and it was truly inspirational to watch this young man compete with such effort and determination. 1) Besides Track and Field, what other sports have you participated in at Sequoia HS? What about before Sequoia HS? I have done nothing other than Track and Field at Sequoia HS, but when I was a little younger, I participated in Karate and Judo. 2) How did you get your start in Track and Field? When I was younger, I participated in Track and Field in the Special Olympics. When I got older, I wanted to do regular Track and Field. I asked Mr. Dilley during my sophomore year if I could join the team and without hesitating, he said yes. 3) What events have you participated in and what are you personal records (PRs) in those events? I didn't pay so much attention during my sophomore season to my PRs but during my junior season I started at 30 seconds on the 100m and 90 seconds on the 200m. I have since dropped my time to 69 seconds in the 200m during this season. 4) Can you tell us a little about your condition and how long you have been dealing with it? My condition is called cerebal palsy and I have been dealing with it since birth. CP is a medical condition that targets various muscles and it's different for everybody. 5) You are a very inspirational person but who are the people that inspire you? First off my mother, because whatever life throws at her she takes it on like it's nothing. Another person is Pat Tillman because he left a very successful career to serve his country. Also, another inspirational person to me is Todd Beemer because even though he knew he was going to die, he still took a stand against the 911 highjackers. And finally Aron Ralston because he did what it took to fight for survival. 6) In terms of practices, can you tell us a little about your workouts. My workouts are a little different from the others. I do whatever I can that is similar to the rest of the team but sometimes when they are doing a complex workout I run laps or stretch my arms and legs out. 7) Tell us a little about your coach Adrian Dilley and how he has supported you on the Track team. Coach Dilley has helped me from day 1 to be as successful as I can. He has also taught me to be a better person. He has taught me how to be part of a team and how to be a good sportsman. 8) Can you also tell us about the Sequoia Track and Field team and what it means to be on the team. Being part of the Sequoia Track and Field team has made me feel like a normal high school student. 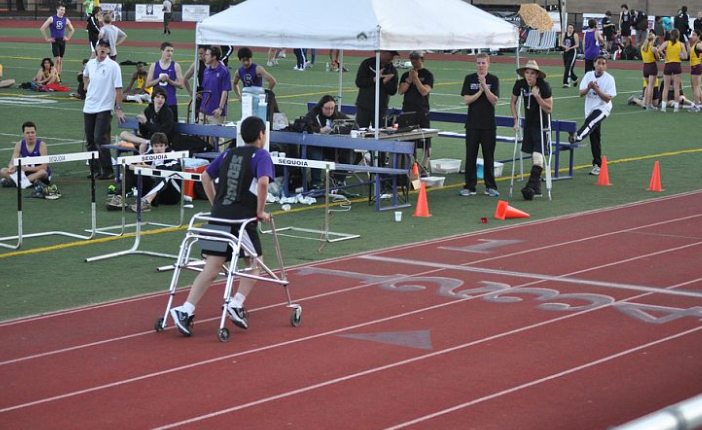 The reason I joined the track team was because I wanted to prove just because you have physical differences doesn't mean that you can't accomplish things others do. 9) Tell us a little about your experiences at the track meets and some of the people you have met after your races. I have met many different people. I have gotten lots of support from those who have watched me run my races. Opposing athletes have approached me and have praised me. I have also met coaches, parents, and fellow students who support my efforts. 10) Have you considered continuing to run in college and do you have any goals involving running in the future? I would like to run in college but I don't know any colleges that I can go to and also run and compete. 11) How would you convince somebody to run on the track and field team and what are the benefits of being on the team? I would say, "you should come out for track, you don't get cut based on talent. It's a great way to meet people and it teaches you how to be part of a team.."
12) When things get tough for you in practice or at the races, what motivates you to keep going? When I am waiting at the starting line for the gun to go off, my heart starts to beat quickly and when it finally goes off I always think to myself, "let's roll". Towards the end of the race I say don't give up, you are almost there. I hope I can PR. I would like to thank everyone who has been so supportive especially the coaches. This is your best interview yet, Hats off to Stephen his efforts ! Stephen, you rock and keep pushing for that PR ! When the gun goes off I think "Lets Roll"! That's awesome! Good luck Stephen!! All you have to do is watch him race one time to truly appreciate what a great accomplishment it is for Stephen to compete. That was cool at the Bearcats meet! Glad I was able to shake Stephen's hand and congratulate him on his PR afterwards. Great interview choice, Albert! Very nice story. What a big heart of courage this kid has. What a wonderful young man. Please don't give up on running in college. Keep your grades up and consider some Division 3 schools. The competition is usually great, but everyone competes and participates in most programs. Great Interview...Stephen is an inspiration.